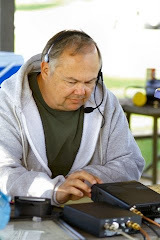 BPL is one of the most widely discussed topics in Amateur Radio. Its proponents claim it will bring inexpensive broadband connections to anywhere with electricity. However, poorly implemented, it can wreak havoc with the radio spectrum used by Hams world wide for both hobby and emergency communications. The hams say BPL can both damage the radio spectrum and be damaged by it. The industry reps we've talked to say that was old tech -- the new stuff is better. As you'll see in our continuing coverage over the next few weeks, we honestly can't tell whether BPL is a good thing, or something that should be stopped in its tracks. Read more about it on their web site: Computing Unplugged.